Sycons Kft. have been designing and executing different types of ecologically adaptable, quick and economic retaining walls since 1994. One of the root causes of slope, embankment or retaining wall breakdown is that aquiferous water behind the retaining wall or embankment, coming from the hill side, is not collected and evacuated, thus, the structure is completely soaked by these waters. The soaked backfill loses its stability and the retaining wall or slope collapses. To repair this situation, a gravel draining body is installed at the boundary of the retaining wall backfill and the natural soil. 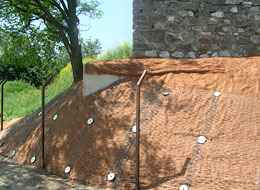 This draining body collects the aquiferous water coming from the backfill, and evacuates it to a sewer (evacuation system) through a drainpipe. 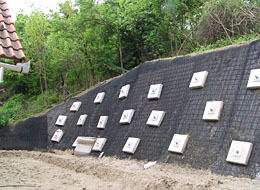 In case of retaining walls higher than 2 m, we use reinforced soil backfill stabilized by geogrid in every case. 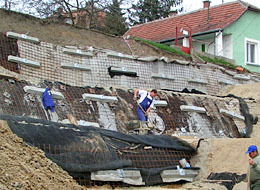 In the backfill, we install a layer of geogrid in every 70-90 cm, which overlap the retaining wall element layers, and connect them almost like a composite structure to the backfill constructed of reinforced soil. 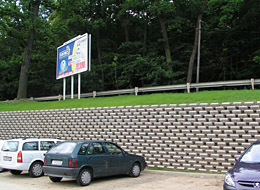 In case of higher retaining walls, continuous waterflow from the soil behind the backfill, or limited backfill depth, this system is applied together with drilled-injected anchors, by installing reinforced concrete load distributor beams at the anchor heads (on the visible slope surface). Anchors and beams stabilize the soil mass behind the backfill on one hand, and participate in the force balance of the backfill and the retaining wall through the geogrids inserted behind the beams on the other hand. The ecological retaining wall, completed by the backfill, is safe, and quick and easy to construct. Investment costs are currently the most favorable on the national market according to our knowledge. Any kind of plants can be planted in the gaps between the elements, thus, the retaining wall will be adapted to its environment, without exposing the traditional, unfriendly concrete surfaces. 2004 - MARKET Építő Zrt.